Have a look at this teaser, which contains extracts from the EPNoSL VIP webinars and forum discussions organised in 2013. This EPNoSL webinar was held on 22 October 2013 2013, 11:00 CET. Please find the recording underneath. This EPNoSL webinar was held on 15 October 2013 2013, 11:00 CET. This EPNoSL webinar was held on 1 October 2013 2013, 11:00 CET. This EPNoSL webinar was held on 11 Spetember 2013, 11:00 CET. EPNoSL Webinar 2: Leading and Managing Change: why is it so hard to do? Title: Leading and Managing Change: why is it so hard to do? This EPNoSL webinar was held on 28 May 2013, 11:00 CET. 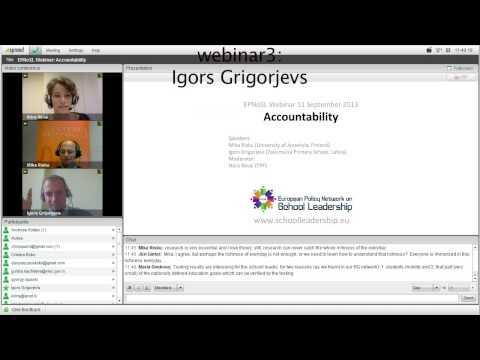 EPNoSL Webinar 1: School autonomy - challenge or privilege for school heads? Title: School autonomy - challenge or privilege for school heads? This EPNoSL webinar was held on 7 May 2013, 11:00 CET. For further social, economical, technical and political development in all countries of the world, schooling and (vocational) education are key. School leaders or education executives1 play a pivotal role in this development process. The real need everywhere in the current situation is to provide school leaders with knowledge, skills and competences for increasing the quality of education. Educational management is a specialist field, a profession.